A Cambodian talk show has come under fire for a mother’s day prank where the show told a 13-year-old girl she would be reunited with her long-lost mother, only to have a cross-dressing comedian waltz out instead. Per Fairfax Media press, the young singer and songwriter, Autumn Allen, appeared on the talk show Like It Or Not for its Mother’s Day edition. However after telling her story about how she hadn’t seen her mother since she was six, a comedian dressed as a woman walked on stage. The prank predictably sparked outrage on social media and has collated a heap of media coverage. 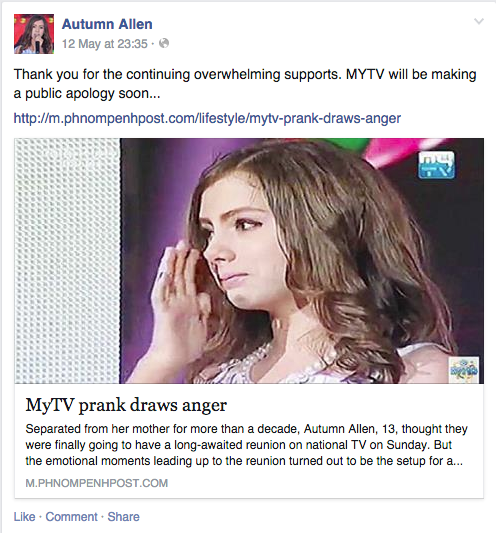 The network behind the prank, MyTV has reportedly apologised to Allen for the joke that clearly went awry. Lead image via Autumn Allen’s Facebook.